Frederick Berryman was born in Dorking in 1881, where both his parents; James and Caroline; and grandparents lived at 1, Adlers Lane, Westhumble. By 1901 the family were living at 11 Leslie Road, Pixham but only Frederick and his sister Lydia were there on the night of the census. In 1905 Frederick married Emmeline Elizabeth Shilling who also came from a Dorking family, who were living at Church Gardens, Dorking in 1901. 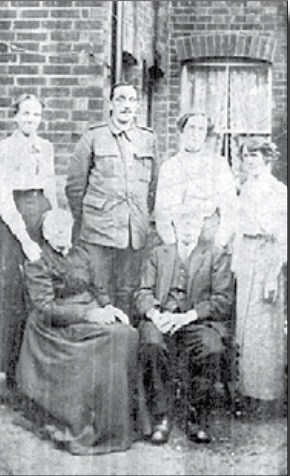 The 1911 census saw the Berrymans living in Adler Lane Westhumble with their two sons Frederick (born in 1906) and William (1909-1933). Gladys was born in 1915 when the family were living at Chalkpit Cottages, Mickleham and lived until 2007. At this time, Frederick was working as a gardener at Norbury Park. Frederick enlisted in the Queen’s Royal West Surrey Regiment at Guildford and was in the 11th battalion. The 11th Battalion of the Queen’s (Royal West Surrey) Regiment was a service battalion formed at Lambeth on 16th June 1915 by the Mayor and Borough of Lambeth. In May 1916 the battalion left Aldershot for Southampton embarking on the SS Caesarea and landing at Le Havre. In September 1916, as part of the 123rd Brigade of the 41st Division, the battalion fought at the Battle of Flers-Courcelette, one of the battles of the Somme and notable for being the first me that tanks were used in battle. The British had developed this new weapon in great secrecy and it came as a surprise to both the German and British troops. By the spring of 1917, the battalion was based at Reninghelst, Flanders about 10km from Ypres and fought in the Battle of Messines which targeted the Messines Ridge, held by the Germans. The battle began on 7th June with the detonation of 19 underground mines beneath the German lines. The massive explosion was reported to be audible in London and Dublin and devastated the German front lines allowing the British troops to capture the ridge and thus greatly boosting their morale. 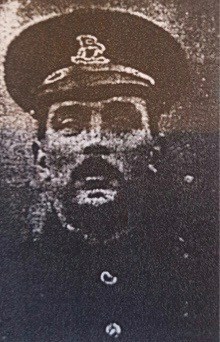 Between 20th and 24th June the battalion was in the trenches near Voormezeele sending out working parties each night to work on forward communication on trenches and it was during this period, on 22nd June, that Private Berryman lost his life. He is commemorated on the Menin Gate, Ypres. Frederick’s widow, Elizabeth Jane Berryman, married James William Gadd of 4 Gravel Hill, Leatherhead in Dorking parish church on 12th April 1919. They continued to live at Chalkpit Cottages until 1937. In the 1938-1945 Electoral Register Elizabeth and James are at 2 Flint Cottages, London Road. Frederick’s father, James (1847-1928) worked as a gardener and his mother, Caroline (nee Dickenson) (1847-1921) worked as a laundress. They were married on 12th August 1877 in Fulham. In 1881 and 1891, Frederick’s parents were living with Caroline’s parents, at 1 Adler Lane, Westhumble. James and Caroline had a total of ten children. Walter James (born 1880-1916) suffered from rheumatic fever as a child and suffered from heart problems thereafter. Frederick’s son, William George Berryman, married Winnie F E Reynolds in 1929. They had five children: David (born 1930), Peter (born 1931), Barbara (born 1933), Patricia (born 1935) and Diana (born 1937). In his later years, William lived at 3 Dell Close Cottages with his daughter, Barbara and Tony, Diana’s son. Tony and his family are living there today. William George, Winnie and Barbara are all buried in St Michael’s churchyard. Frederick’s daughter Gladys married John Lilliott at Mickleham in 1938. The Lilliotts lived at Lammas Cottage, School Lane, Mickleham.